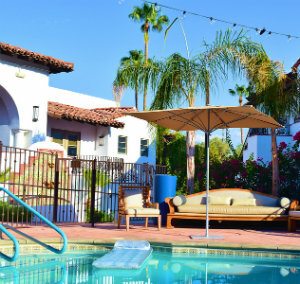 As one of Palm Spring's oldest neighborhoods, the community of Warm Sands dates back to the 1920s, eighteen years before Palm Springs was incorporated as a city. At the time, the community was made up of private residences and ranches. Nearly 100 years later, this neighborhood has been transformed into one of Palm Spring's most family-friendly neighborhoods. Located south of Ramon Road and north of Sunny Dunes Road, Warm Sands real estate belongs to an area that measures approximately half a square mile and is home to a range of gated communities, adobe and Mid-Century Modern single-family houses, and manufactured homes. This neighborhood is also the site of many of Palm Springs resorts, hotels, and romantic getaways. In view of the incredible San Jacinto Mountains, it's easy to understand why residents and visitors love to stay in this versatile community. Start your search for Warm Sands real estate listings below, or discover more about family-friendly amenities near this community. Register for complete access to Palm Springs real estate listings. Start your search by browsing Warm Sands homes for sale and expand your house hunt to include properties in the neighboring communities of Tahquitz River Estates and Sunrise Park. Warm Sands real estate lines roads with eloquent names like Vista Oro and Camino Real which translate to "Golden View" and "Royal Road" in Spanish. With towering palms stretching up to meet the sky and the majestic San Jacinto Mountains in the distance, it's easy to understand where names like these come from. Warm Sands once was a neighborhood popular amongst Palm Spring's vacationing stars. Today, it is part of the city's resort network, and residents will find that their homes are situated near to some of the city's finest resorts. Warm Sands homes for sale come in many kinds. There are numerous historic properties in the Warm Sands neighborhood, many of which date back to the 1920s. Home buyers will find that adobe was a popular building style in the era when this neighborhood was first constructed, and many of the houses reflect that. Many of these older houses have been carefully updated to keep with the trends of the modern decade, while others have carefully preserved their unique historic style. Find wood-burning fireplaces in the living rooms, handsome rear courtyards, and custom detailing in the kitchens and bathrooms. Warm Sands is one of the most affordable neighborhoods in the city. Those looking for a small vacation property or an affordable place to live close to the Palm Springs downtown region may enjoy one of the manufactured homes in the east end of this neighborhood. This quaint residential corridor offers residents an affordable space to live in a friendly community. Warm Sands homes for sale enjoy a close proximity to the heart of Palm Springs. In fact, this community is within walking distance of the downtown corridor where art galleries, cafés, bars, and a vibrant nightlife is easily accessed by visitors and locals alike. Even closer, there is a small pocket of shops on the intersection of Sunrise Way and Ramon Road where locals like to purchase their daily needs. At this crossroads, find a combination of restaurants, banks, a grocery store, and other key services. When it comes to outdoor recreation, residents of Warm Sands who love to golf should visit the nearby Mesquite Golf Club. Situated on rolling grass hills, the picturesque course winds golfers past landscaped flower beds, crystal clear waterways, and challenging sand traps. The course is a local favorite and was once much loved by the famous Bob Hope. On the opposite end of the community, residents will find themselves at the base of the San Jacinto Mountains. Dozens of trails crisscross through the area and forge their way to the top. Those who have the stamina and determination to make it to the upper region of the mountain will find that the landscape around them will transform from sandy deserts and cacti to lush green forests and alpine meadows. Has one of active Warm Sands real estate listings piqued your interest? Contact me for more information on how to take your first steps towards fulfilling your Palm Springs real estate dreams.